Portrait of Hilliard Taylor. Courtesy of Our Boley Picture Book. Image available on the Internet and included in accordance with Title 17 U.S.C. Section 107. TAYLOR, HILLIARD (1849–1913). Hilliard Taylor, businessman and son of Abraham Taylor, was born into slavery in June 1849. Census records consistently list his native state as Arkansas. He was brought to Texas in September 1865. He married Emma Ferguson in 1867. Taylor and his wife were the parents of possibly a total of eight children. The 1880 census listed two sons and three daughters, while the 1900 census listed three different sons. The family lived in Houston at 2101 Caroline, property he purchased for $100 in 1872 from William B. Pulliam, an African American who later became a city alderman. Trinity United Methodist Church. Image available on the Internet and included in accordance with Title 17 U.S.C. Section 107. 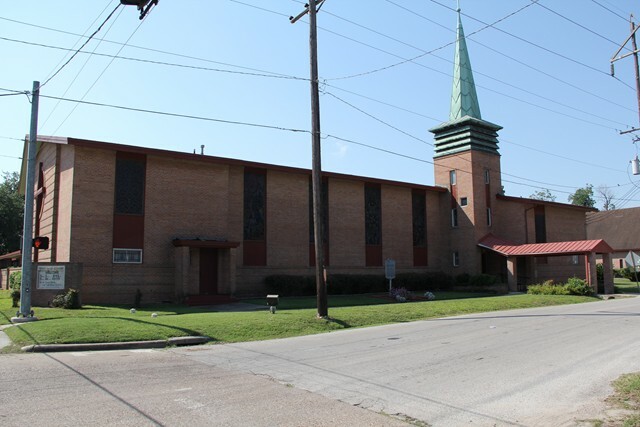 Taylor was a leader of Trinity United Methodist Church in Houston, which was founded as a mission before slavery ended. According to the late historian Bernice McBeth, who conducted extensive research on the church, Taylor served as superintendent of Sunday school. When the church was destroyed by the Galveston hurricane of 1900, Taylor was a member of the building committee. Taylor was employed as a porter at Hutchins House, a fashionable hotel and meeting place where he met many influential city and state leaders. Many Texas and Houston associations were organized at the hotel, including the Houston Press Club, the Houston Board of Trade and Cotton Exchange, and the Harris County Medical Association. In 1871 Governor Edmund J. Davis appointed Taylor as a city alderman, and he became a leader only six years after slavery ended in Texas. He was among Houston’s first African-American lawmakers affiliated with the Republican Party. Main Street of Boley, Oklahoma. Courtesy of Our Boley Picture Book. Image available on the Internet and included in accordance with Title 17 U.S.C. Section 107. Town Council of Boley, Oklahoma. Courtesy of Our Boley Picture Book. Image available on the Internet and included in accordance with Title 17 U.S.C. Section 107. In 1892 Taylor began working for Theodore Keller, a merchant who owned a large wholesale grocery business and cotton operation in Houston. He worked there for twelve years learning the trade inside out. Taylor decided to venture out on his own with his extensive knowledge of the grocer and cotton business. In 1904 he moved to Boley, Oklahoma, and was instrumental in the organization of the town. He became a very prosperous cotton merchant in the state and owned the Hilliard Taylor Gin Company as well as operated two cotton gins. He was president of the Boley Commercial Club, a member of the Boley city council, and a stockholder in the Boley Light & Power Company. Evidently, by 1910 Taylor, whose first wife had died in 1900, had remarried; the census of that year listed his wife as “Sida” (aged thirty-four). Taylor Family Monument. Image available on the Internet and included in accordance with Title 17 U.S.C. Section 107. Taylor’s daughter, California, also moved to Boley where she married a banker. His son, James B. Taylor, remained in Houston and was employed as one of the first African-American postal workers. He was also captain of the Cox Rifles, and his wife, Josie, was an educator and owned a hat shop in downtown Houston. Another of Taylor’s sons, Henry, resided in New York. Hilliard Taylor died in Boley, Oklahoma, on November 9, 1913. He was buried in Houston’s Olivewood Cemetery alongside his wife Emma in the plot he purchased for $65.00 when she died in 1900. Their large tombstone, shaped like a house with the name “TAYLOR” inscribed in bold letters, is the only monument to Taylor in Houston. O. H. Bradley, “History of Boley,” Souvenir Program of Boley's 30th Anniversary Celebration, September 18 to 23, 1934, Dill Collection, Okfuskee County Historical Society (http://files.usgwarchives.net/ok/okfuskee/history/town/hobole01.txt), accessed July 11, 2013. Galveston Daily News, November 8, 1878; February 11, 1904. Muskogee Cimeter (Muskogee, Oklahoma), November 3, 1904. Handbook of Texas Online, Patricia S. Prather, "TAYLOR, HILLIARD ," accessed April 18, 2019, http://www.tshaonline.org/handbook/online/articles/fta79. Uploaded on July 24, 2013. Modified on July 11, 2017. Published by the Texas State Historical Association.